So someone crammed us in a room at the Porterhouse in Covent Garden and forced us to drink some extraordinary beers, produced in the US and sold in a can! And one that we were told WEREN’T going to be available at the GBBF the next day! Talk about exclusive! And after what I drank my verdict is: Blimey, the Americans are flipping geniuses. 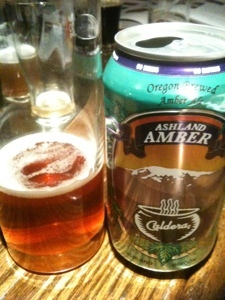 So I had a deliciously refreshing, fresh citrus smelling, caramelly- sweet and stupidly drinkable Ashland Amber (5.6%) by Caldera Brewing Co in Oregon. 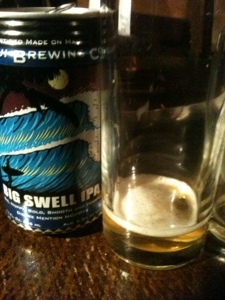 Great way to start the night, if a little heady at over the sessionable strength! So then there was a big fruity, smooth, tropical tasting Maui’s Big Swell IPA (6.8%) – I think this was a fave cos everywhere I turned people were downing it. Either that or someone had over ordered on the number of cans of this one! Somehow I reckon it was the fact that it hit the spot for me on the flavour point and the strength. 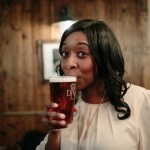 I could imagine that washing down a nice Duck with Orange & Beetroot Gelee or something like that! Corrrrrrrr! So basically I was pretty stoked, but sadly yakkered too much to get anywhere NEAR the remaining 13 other beers on offer in cans that night. 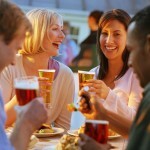 Time for a beer hunt, I think! 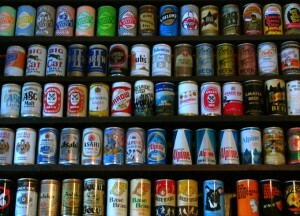 Aw, so nice to see some ‘merican beers! Amazingly, I have never SEEN, much less tasted any of those! 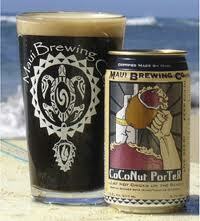 But that Maui Brewing CoCoNut PorTeR sounds amazing; might have to go on the hunt for that one.